In conversations I’ve had, countless people have expressed their desire to give a TED and/or a TEDx talk. To be honest, I get that. It’s exciting! I’m surrounded by inspiring people and I myself want to share their stories with the world. Consequently, I thought I would discuss my experience throughout the process in the hope that others will find it helpful and learn about what it entails. At the end, I also include some advice for prospective speakers. There were several responses to the TEDx talk I gave back in March. How? What? Why? When? Cool! It goes all the way back to the Event Management Society Conference I spoke at through the University of Brighton in 2014. Afterwards, an undergraduate event management student in the audience stood up and invited us all to volunteer at the Pride in London parade a few months later. Having never been to a Pride parade before, a friend and I did take him up on the offer and we continued to stay in touch. A year on, I happened to see a Facebook post from this same student about receiving a TEDx event license in the UK. Naturally, having worked on so many TEDx events in Japan and the UK, I offered my help from afar in Italy. His response: “No, I want to see you on the red carpet!” I was floored. That’s when I started asking people around me. I talked to close friends who knew me and my goals well. I talked to former teachers and professors. I messaged friends in faraway lands that I’d often Skype with about our changing global society. I kept a log of all the ideas and thoughts I had and then researched them, checking to see if other TEDx talks had already been done on these topics. At times, I found myself in a Wikipedia blackhole. I flushed out thoughts and ideas with other friends to test out whether I could speak for at least 10-11 minutes on them. You see, talking about travel was too easy and expected, but there had to be some way to weave its stories and consequences into my narrative. The clock was ticking. In between my full-time job, part-time MBA, and weekend trips, I had to deliver a pretty full outline and a rough draft of my talk/script by December 1st so that it (and I!) could be approved by TED Headquarters in New York . Weirdly enough, it was a phone call with my mom that gave me my two bedrocks to work with: being uncomfortable and tolerance. Now, it was up to me to connect them and enthrall my audience. I pieced together a series of points in an old school outline format – think Roman numerals followed by lower-case letters and numbers, jotted down a few paragraphs, shot the documents to my friend, and packed my bags for Berlin over my long Thanksgiving weekend. 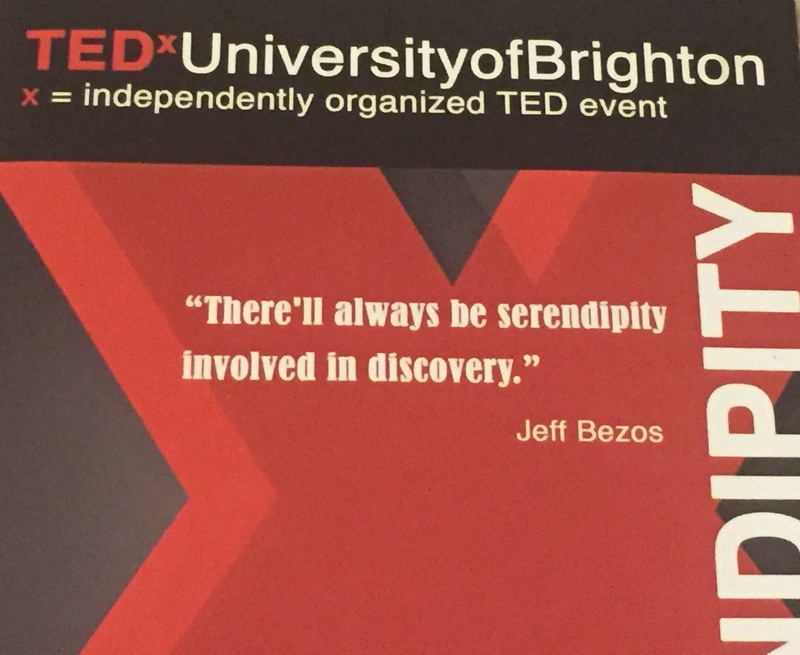 A couple weeks later, it had been approved my TED HQ and my bio had been uploaded to the TED and TEDxUniversityofBrighton websites. But the work had just begun. I needed to actually finish the talk, memorize it, practice giving it, receive feedback, and then apply it all before the big show on March 12. Constant revision was a expected. December mainly consisted of my “planning and research phase”. I received a Speaker Toolkit PDF from the TEDxUniversityofBrighton organizer and speaker coordinator. This included the standard TED speaker handbook (available online) as well as a lot of advice compiled by the event organizers – all student volunteers by the way! I complemented this information with the rest of the details from the TED website and TEDx speaker booklets and presentations given to me by my former TEDxFukuoka team when I returned to Japan over Christmas. In between, I researched blogs about crafting TED talks – what to do, what not to do, how to structure it, how long to speak for, habits to avoid, etc. I also watched brilliant speakers on and off the TED stage to see how they worked their magic. There are a lot of different kinds of TED talks – what would be the goal of mine and how would I convey this verbally and non-verbally? I continued to read and read all while adding to my rough draft script. I had a pile of printed-out articles and TED advice columns on my desk. I read blogs from celebrities who talked about how it took them a village to create their TED talks. I read about communication techniques, presentation skills, and ways to improve them. I had mini Kindle books, like “How to Give a TED Talk” downloaded on my iPad. Then, I watched bad TED talks I’d seen before in person and online to remind myself not to repeat certain ticks and tendencies. I reviewed past documents on all of the previous TEDx events I’d work on to see what I could gather from them. Thesaurus.com was bookmarked on my computer to ease editing. I scoured through old photos of my travels in an attempt to jog some of my memories and stories. Every day involved at least 30 minutes of working on the talk. In an out of character move, I even cancelled a weekend trip to Austria and holed myself up in cozy cafe in my local Italian area in an effort to complete the talk script one January weekend. There was just one thing I was hung up on. I wanted to tell a personal story. I wanted to let people in. I’m really not the superwoman a lot of people think I am (I know this because they told me.) My natural inclination was to discuss a time when I was uncomfortable but it took a Skype date with one of my best friends from college to trigger what I needed. My perspective had been all wrong. He told me to tell him about a time when I had been intolerant. Lightbulbs went off and I ended the conversation with a giant thank you and a virtual hug. While my second-floor Italian penthouse room was my home base throughout this process, it was downstairs in my kitchen where from the talk began to come to fruition. From about 10:30pm to 2am one night, I proceeded to walk back and forth, with my talk in one hand and a glass of prosecco in the other, and memorize my talk in its entirety. Finding your own zen and getting into the zone to focus was key in doing this! My ensuing strategy was based on the following timeline: My final script was due to the organizers in mid-February. At the beginning of March, I had a Skype call with my friend, the event organizer, to give my talk in front of him and receive feedback. Thus, in between I needed to be able to give my talk in front of people in person and then listen to and apply their feedback. Fortunately, working at a study abroad program meant that loads of people were around to come to a few practice sessions or even sit with me one-on-one to help me practice. I scheduled two evening practice sessions for students to come watch and then other friends offered to meet up to listen at other times. Frankly, it was SO much harder and more nerve-wracking giving the talk in front of them because I knew and cared about them. All of the students, professors, colleagues, classmates, and friends who took time out to listen to and watch me while providing tips were immensely helpful. It was definitely a team effort and I remain grateful to them! With less than a week to go, a few professors came to watch me practice one last time and I got some final suggestions. The next day, I hopped a plane from Venice to London Gatwick for my four-day trip. Bonus: I had big plans for reunions with friends there. The morning of the event, even though I had the talk memorized and my nonverbal mannerisms and appropriate pauses down, I was still fretting. A couple of my friends I gave my guest passes to went straight to the event while I headed down to Brighton Beach to practice my talk alone and pace like a crazy person. The morning session flew by though with a few technical glitches that made me thankful I did not have slides to go with my talk (more on that later). I had requested the afternoon session so that my family and friends back on the west coast of the US didn’t have to wake up too early to watch live. As my slot neared its 4pm blast-off, you would have found me pacing backstage mic-ed up and rocking out to Nicki Minaj and Jay-Z to pump myself up. I Due to the preceding speaker, I walked out to the red carpet a few minutes early but poised to make it happen. While speaking, I could only see about 5 rows up from the floor but I could tell the 300-person theater was full. Later, someone would tell me they were hanging on my every word. There was a moment where I almost lost my place but scrambled to recover so I don’t think you’ll spot it. I also skipped a sentence in there 😉 All in all, it seemed like I blinked and the talk was over and I was walking offstage. Post-event, I finally got wifi for the first time all day and saw that my phone had very much been blowing up all day. I received a lot of positive feedback and in person and from faraway. Really, I was just grateful it all came together in the end to make everyone’s time and energy worth it! The exhausting day ended with celebratory sushi in the center of Brighton. Like I did, you can read A LOT online about doing a TED/TEDx talk but I have five additional takeaways/pieces of advice for those who have this on their bucket list. 1. Tell people you want to do a TED talk. And if you do this, be ready to explain what you want to talk about. Have options here because surprising the audience with something unexpected is typically preferred. As with everything else, connections help. As a “back-up”, check local TEDx event offerings and see how they curate speakers. Some events allow people to apply or nominate others. It just depends. 2. Practice, practice, practice your presentation skills. Every single one of my jobs has required a ton of public speaking so I feel pretty comfortable doing it now. However, TED/TEDx is a different animal. A fellow speaker told me it was much harder than doing his normal presentations in front of thousands of people. Your speaking ability can make or break the talk. I have seen it in person and online. People with great stories or projects who just fall flat on their faces on stage. 3. Slides: They are not mandatory. If the organizers say they are, write your talk and legitimately think about how images would support and enhance it. After I finished writing mine, I did my best to work on presentation slides and even had a graphic designer friend design a presentation template for me. Yet in the end, I felt like it was too forced and due to the nature of my talk, I wanted people to really pay attention to my words and not be distracted by what was on the screen. ALSO, many speakers fall victim to staring at the screens with their slides on the stage floor and fail to make enough eye contact with the audience. Watch TED talks and look for this. 4. You MUST be proactive in giving and receiving feedback. I actually asked two of my MBA classmates to record me giving the talk for the first time so I could watch it later. It was tough! Then, they gave me feedback in person. If you don’t go out there and ASK for feedback on this, you’re not going to get it. Without feedback of any kind, your talk won’t make it. 5. Lastly, throw all self-consciousness out the window. This is absolutely imperative. If you are too worried about what your practice audience will think of you, you’re not going to feel natural and you will not be able to connect with the real audience. I had undergraduate students I was “in charge of” giving me constructive criticism. Be thankful. Be vulnerable. After one practice, I was met with follow-up questions from MBA classmates about the content and storyline of my talk and I divulged a bit more. Be open to help and curiosity here. Phew! Now that you have followed my journey and read some of my reflections, here’s my final product. I hope you enjoy it and learn a little something, too. If you do, feel free to share. And of course, again, thank you to everyone who helped me make this talk a reality. It would not have been possible without you.